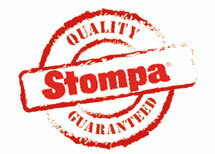 You've paid good money for your Stompa product, so a few minutes spent reading this could save you a lot of trouble and expense. We strongly advise against the use of power tools. Although quicker in many circumstances, they are prone to over-tightening screws which can result in split components. It is easier to feel any resistance and avoid over-tightening by using hand tools. 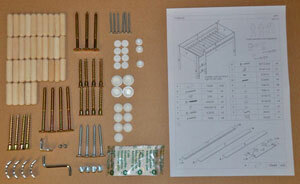 Identify all components against the assembly instructions before commencing assembly. Familiarize yourself with their purpose and location within the completed item. This will make assembly easier. Please contact us for advice about any missing/damaged components before commencing assembly, either via telephone on +44 1943 608 775 or email us at sales@stompa.com. There can sometimes be several, similarly sized screws provided in a fittings pack. Refer to the instructions to ensure the correct size is selected for each purpose. Inserting and tightening a screw that is too large for the hole can cause the wood to split. Cam screws should be screwed in firmly so they are flush with the surface and do not indent the surface of the component. Do not over-tighten. Follow instructions in the correct order. Failure to do so can cause confusion and missed steps, leading to possible damage of the components. Always insert dowels into the components shown on the instructions and not into the adjoining component. Try to insert all dowels by hand. If the holes are a little tight, use a soft mallet to hammer the dowels in gently. Several gentle taps cause less stress to the components than one large, heavy tap. 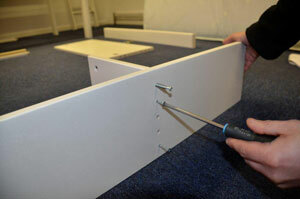 Ensure dowels are inserted fully before commencing to the next step, especially when instructed to use glue. Always use glue where instructed. There is no need to glue all dowels where not specifically instructed to. Some components are drilled for either Left or Right use. Identify and allocate their intended purpose prior to locating dowels, screws, etc. Make sure joining components are pushed together gently and squarely. Support one component on a level surface when joining and avoid pushing one side in first, before the other. This can force dowels in at an angle causing the wood to split. Ensure screws align with pre-drilled pilot holes before fully tightening. Where screws are self-tapping, ensure components are correctly positioned before commencing. 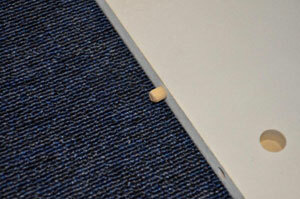 A hole misplaced by a few millimetres can make it difficult to re-position the screw in the correct location. Make sure furniture carcasses are perfectly square before nailing back panels. Be careful to hammer nails squarely to avoid coming through on the other side. Nailed back panels provide some structural rigidity to a carcass. Although we often supply more nails than required, ensure enough are used to create a solid join. Space nails evenly. Assembled items can often settle during use. Periodically check all joins for tightness, especially within the first few weeks of use or if you move the product. Keep assembly instructions in a safe place for possible future use, along with any provided tools. If disassembly is required, e.g. when moving house, please contact us for advice. Keep fittings together and be careful not to lose. If anything is lost, contact us for advice. Please don't try to source similar fittings from DIY stores. Manufacturers use different methods in the assembly of their furniture. Please ensure our instructions are followed precisely even if your prior experience with other flat-packed furniture suggests alternative methods. If you are unsure of any steps or methods, please contact us for advice on +44 1943 608 775.